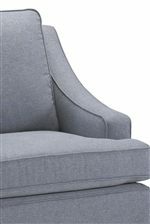 With its smooth, tight upholstery and large rolled arms, this swivel chairs provides a unique, transitional style fit for a wide-range of home decor. Its swivel glide mechanism will lull your child into a sweet slumber, while its stylish design will stand out in any nursery or bedroom. 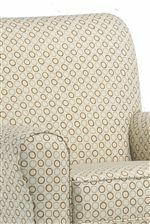 Get cozy and comfortable with your little on this upholstered swivel chair. 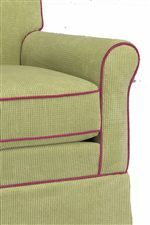 Pair with its matching ottoman for head-to-toe comfort and coordinating style. The Storytime Swivel Chairs and Ottomans Mandy Swivel Chair with Tight Upholstery by Best Chairs Storytime Series at Best Home Furnishings in the St. Louis, Chesterfield, St. Charles, MO & Waterloo, Belleville, Edwardsville, IL area. Product availability may vary. Contact us for the most current availability on this product.